I know that means "How are you?" in English, or in recent vernacular "Wassup?" But a literal translation might be more along the lines of "Are you going to comment?" Why do I raise this? Well, follow along. Bloggers, in particular humour bloggers, are a unique bunch. They love to let their imaginations run wild. 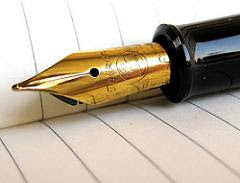 And they love to write, to share their innermost thoughts in a periodic blog post. But they're immensely insecure. They crave feedback! It's like a drug and bloggers can't create until they're satiated in piles of prop-up praise. 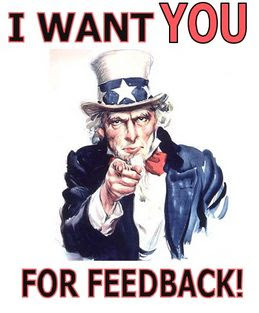 But feedback is so important. A comment on a blog will go right to a blogger's head. It'll help feed the creative process. And it'll let a blogger know that more than just his mom and her blue-rinse-set residents at the home are taking any notice of what he has to say. 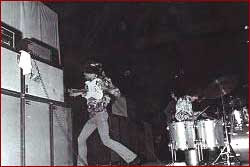 Jimi Hendrix and Pete Townsend leave feedback. It worked for these guys! It can work for you, too! But I digress... thank you for your words of wisdom. As a comment whore myself, (because I obviously have no friends in real life,) I hereby renew my vow to read to the end of the post and to add words of encouragement... or adulation... or ridicule... or whatever. Now I have to comment (rolling eyes). CatLadyCarew already took my Ruffles comment and mooooooog35 got the best comment thus far with his no comment? The pressure is killing me. Hey, maybe this is why people don't comment more on blogs? It's too much pressure. And Noname? I'm guilty of cyber-drive bys! I try to leave comments all the time, but sometimes I'm stumped! Probably because of this darn zombie who's always nibbling on my brain! The more he takes, the less I comment! AND... CatLady's got it "write" change the booze to DDP and that is so "me" getting inspired to blog! Anyhoo, I appreciate YOUR support and look forward to your comments. You're the best Noname! thats a lovely color youve chosen for your blog! Sometimes readers have reasons for not commenting. For example, while this is definitely NOT true with your blog, I know that over at my blog I never write anything that is the least bit worth commenting on. The fact that I get any comments whatsoever totally amazes me. Feel free to comment on my self-esteem problems or on my perfectly realistic view of my writing. Hmmmm....kinda disagree here. But then again, I don't consider myself anywhere near humourous, either. I blog for the therapy. It allows me to just put it out there. Get the load off my mind. Release the clutter, if you will. If it gets read, then okay. I'm not out to grab attention, per se. I blog what I know and feel. You agree or disagree and I pull no punches. A half-drunk bottle of scotch and Ruffles... Now there's a real man! I'm the other half-drunk. Point to the place where Hendrix got his herb, and I'll leave all the feedback you can handle. Confessions of a Humor Blogger, what an interesting concept. Excuse me, but I'm jonesin'. But what if I can't think of a witty caption? 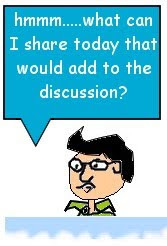 I love hanging out in the humorous blogsphere with you! Quirks: You're a shining example! You leave a comment virtually everyday, along with Cat Lady and Don. I feel the love. Nooter: I'll give you that. It can be ruff can't it? Joel: Pshaw! That's all so much stuff and nonsense. subby: Different strokes for different folks. Don: But it's early in the week, right? Me-Me: I have to reread this post. People are taking it way too seriously. Megan: Hey that's just Wednesday. As they say in Vegas, "I'm here all week". Amy: Likewise. And thanks for the comment! Alright I admit it..I'm guilty of doing drive bys..I'm just a blog tease..*sigh*.. I try to change my ways..but speaking of pressure...just look at all those witty comments in front of me.. I suppose I could always leave it down to "It was good for me, was it good for you too?" So I have to ask - Is your blog name pronounced Non-Amed-oo-fus? My bottle of scotch, like Hemingway's, is usually 3/4 empty. And that's as far as that comparison goes. As far as comments go, I really appreciate this post because I didn't know people could comment on my blog until I read it. Then I checked and whaddya know, it is possible to leave comments on my blog. Not that I care, mind you, because I'm usually passed out and wouldn't read them anyway. Nips: Oh, wow, *lights cigarette* that was great. David: That's my cousin. Thanks for asking. MikeWJ: Some of us hem and haw about commenting but I admire you for hemming your way. Never knew that comment allez-vous meant spill the beans bucko! Merci pour la leçon monsieur! Arrived here because I thought of changing blog name Comment Cultivator to Comment Allez Vous and see that my brain is not the only one that works in this way. I offer these comments to you: To have been pinned to the clothesline - as a child - along with the laundry, seems fantastic. Your tinfoil hat with horns is something I want to recreate and wear on my own head. Now you can sweep away the Ruffles crumbs. Of course none of this is true. I made it all up. But I hope you come back..and see what else I can make up.